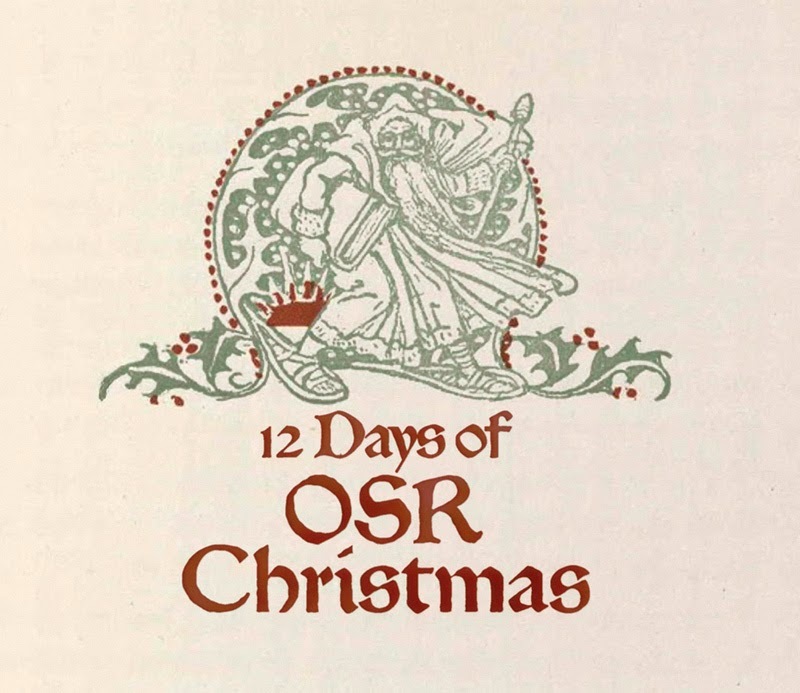 Yeah, in less than 48 hours we are going to kick off OSR Christmas. Which means December 9th. Wow. Remember, if those gifting have a website, they are going to host their own giveaway - The Tavern is just going to give directions. Allow folks 1 day or 1 week to make a comment and enter, the choice is that of the gifter. For those hoping to get lucky and snag a gift - you need to comment on the relevant post at the site giving away the gifts to have a chance. On each of those 12 days The Tavern will be giving away a $10 RPGNow gift certificate and maybe more - that you'll be entered for by commenting on the relevant Tavern post. For those that are gifting - I know a 2 day warning is short, but I do need a volunteer for Dec 9th and one for Dec 11th. Email me at tenkarsDOTtavern at that gmail thing if either day is good for you. First to volunteer for either date gets it - I'll work on the schedule for the rest of the month on Friday in all likelihood. I'll send you an email confirmation before i head to work tonight if you are confirmed for the 9th or the 11th. The Tavern's linking post to the individual gifting sites will go up in the afternoon of the day(s) in question. I ask the gifters to send me a link to their post so I can send the Christmas Carolers your way. I'll get my posts ready to starting on December 9, with the first one going up at 6am EST, and the 2nd going up at 6pm EST. With additional posts to follow every 12 hours for 12 days (for 24 total gifts to be given, alternating between PDFs of Basic Psionics Handbook and print copies of the Creature Compendium). Let me know if that timing works. Look like we'll have Rich's insanity kicking off on the 9th and running for 12 consecutive days. We'll also have James' Spahn kicking off a more regular giveaway on the 9th. That's probably the best way to go for this. Creature Compendium print copies are from 6amEST-6amEST the next day; Basic Psionics Handbook PDF copies are from 6pmEST-6pmEST the next day. Canadian print copy of CC1 will be 12/12/15. International (non-US/non-Canada) copy of CC1 will be 12/15/15. Print copies of CC1 for other days from 12/9/15 thru 12/20 (excluding above) will be US only. Sent you an email with the link to my G+ profile, figured I'd post it here as well.